Typical analysis (For 3g serving, 15 tablets) Energy 13 kcal, Protein 1.98g, Carbohydrate 0.43g, Fat; 0.26g, Vitamin A from beta carotene; 1665 i.u./63%*, Thiamin (vitamin B1); 0.67mg/47%*, Riboflavin (vitamin B2); 021mg/ 13%*, Vitamin B12; 4ug/ 400%*, Iron; 8.0mg/57%*, Zinc; 2.13mg/ 14%* (*EC RDA%). *Chlorella is also the source of the highly researched C.G.F. 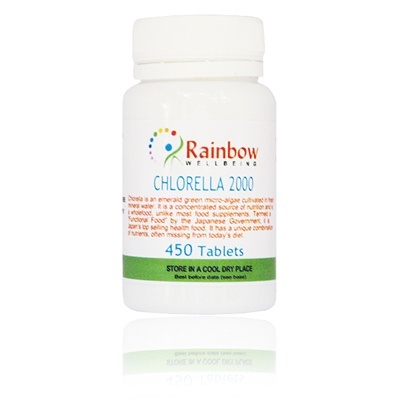 (Chlorella Growth Factor), a complex combination of Peptides, Nucleotides and Amino Acids. Take, as food supplement, 3g serving (5 tablets three times a day) before meals, Introduce to diet slowly 4-6 tablets daily and increase gradually.